Then in 2004, The Passion of the Christ forever changed my understanding. Christ’s Passion aptly translated the Greek word “to suffer.” Bookended by triumph and seeming defeat, the six-day journey carries Jesus from palms under a donkey to nails on a cross, all leading to Sunday where Passion becomes redeeming power. But how does that look for us? What is the connection between our Passion and our passion? And how does it relate to Christ’s Passion, to his rejection-turned-resurrection? During a recent conversation with a friend, I believe I connect those dots. To see my smiling friend, you would never know his backstory. He has endured unspeakable hurt, the kind that derails destinies and causes him to question God and His purposes for his life. Despite many victories, he still struggles with the residual effects of those childhood traumas, and last week, he briefly relapsed into an old destructive pattern. This setback occurred on the eve of an event during which he expected to minister to others and proclaim the goodness of God. Yet there he was: smiling outside while spiraling inside. It was at this intersection of pain and possibility that God unlocked the door to his purpose. When he pressed through his problem and honored his commitment, God met him and contradicted his fears and fallacies about failing. Not only through familiar faces but through strangers, discerning, compassionate strangers who spoke into his life and ministered hope and healing to his brokenness. What’s more, as he let Christ’s blood-bought love flood his soul, God began to reveal His plans for this beloved son in startling color and detail. He showed him how the wounds of his past would pave the way for a wonder-working future. And those ministering strangers from before? Many of them had skills and spheres of influence that could aid my friend in carrying out the missions God set before him. This, I realized, is the marriage of the three passions: where our Passion (suffering) leads us to Christ’s passion (exuberant love and devotion) for us, and He exchanges our Passion for a passion (calling, destiny) that will heal us, minister to others, and bring glory to His name. Much like The Passion we commemorate this Week. 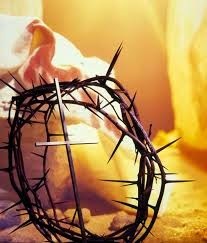 Holy Week culminates tomorrow in Good Friday, the death to end all deaths. And when I weep at the thought of the cross, I will cry not because I am wretched but because I am redeemed; I will wail in reverence not regret. Because I understand Christ’s Passion as the ultimate proof of his passion for me. And as we let His passion overcome our pain, He gives us instead a passion worth living for...as His passion for us was worth him dying for. May our passion for God be ignited this Holy Week. Lovely as always. Happy Easter.